1.To prepare: Prepare all the solid ingredients first. 2.Cut chicken breast into 1/2-inch (15mm) morsels. Marinate in a scant amount of sake and light soy sauce for about 15 minutes. Drain; discard marinade. 3.Blanch shrimp in hot water for 30 seconds, remove, and pat dry. Leave whole, but if very large, slit half-open down the belly, press out flat, and cut in half crosswise. 4.Lily root is worth trying if you can find it. Its shape is somewhat like a flattened garlic bulb, but its flavor is mild and it has a pleasant, delicate texture. Separate bulb into segments and parboil gently in lightly salted water for 4-5 minutes. Drain. Wash trefoil or other greens, pat dry, and chop coarsely. 5.Shell and peel ginkgo nuts and use whole, if you are able to find fresh ones. Peel and slice chestnuts. 6.To assemble, steam and serve: Beat eggs in a medium-sized bowl. In another bowl mix the room-temperature dashi, salt, mirin, and light soy sauce. This recipe is one in which chicken stock is as good as dashi, not just a substitute. Pour stock mixture in a thin stream into beaten egg. Mix well, but do not beat. The surface of the mixture should be free of bubbles or foam. Strain. The seasoned stock mixture should be 3 times the volume of beaten egg, so apply this ratio of 3:1 in adjusting this recipe to the number of diners. 7.Divide the prepared solid ingredients between 4 cups, except for chopped trefoil or greens. Ladle the egg stock mixture into the cups, filling them to about 1/2 inch (15mm) from the top. Add chopped greens. 8.Cover each cup with plastic wrap or foil and set in a hot steamer. Cover steamer and steam over medium heat for 20 minutes, or place foil-covered cups in a bain-marie and cook in a preheated 425° F/ 220° C oven for 30 minutes. 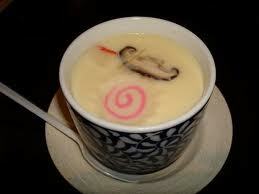 9.The chawan-mushi is done when a toothpick inserted in the center comes out clean. The custard should be set but still jiggle freely. The volume of the custard will not increase much. It is overdone if the top is pocked or cracked and tough looking. 10.Serve hot or chilled and eat with a spoon and chopsticks. If you intend to serve chilled chawan-mushi, omit the chicken, which might develop an odor in refrigeration.